Crofts Estate Agents are delighted to be marketing this three bedroom semi detached property which is located down this popular residential street in central Cleethorpes. Just a short walk from St Peters Avenue and the seafront, this property has three reception rooms, large landscaped gardens and many more key selling features. 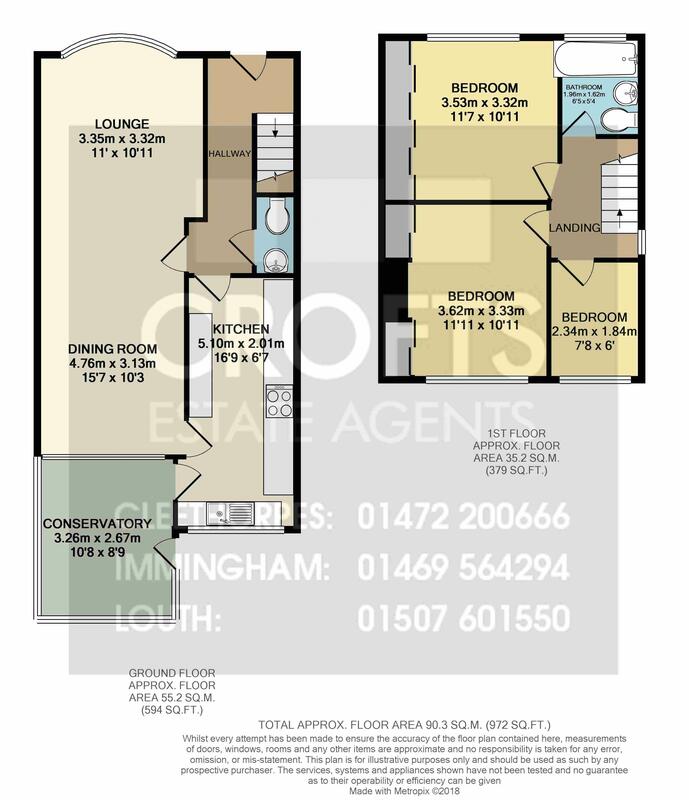 To the ground floor, the house comprises of the entrance hallway, W/C, front and rear lounge followed by the large kitchen and rear conservatory. The first floor has three bedrooms, all with fitted wardrobes and the family bathroom is a modern room with three piece suite. The rear garden is a real gem and must be viewed to fully appreciate its true beauty. Viewings are available immediately. A really welcoming entrance hallway which leads down to the W/C, kitchen and lounge rooms. Carpeted throughout with a PVC front door and carpet leading up the stairs onto the first floor landing. Located in the under stair cupboard, the W/C provides a downstairs toilet with wash basin. The room is tiled throughout which gives it a modern finish and also there is a side uPVC window which lets daylight fill the room. The kitchen is a wonderful size and has a range of wall and base units which provide excellent storage space and also brilliant worktop space. There is a breakfast bar which provides an eating area and the rear uPVC window brings light straight into the room. The conservatory is located through the kitchen and backs onto the main reception area. A separate room to the rest of the house, ideal for those summer months as this room opens up onto the back garden. A real sun trap. The two main reception rooms in the house have been opened up to create large open plan through room. The rear of which is a cost sitting room with a gas fire and has a real warmth to it. The front section of the room is the main sitting room which has the front uPVC curved bay window and again has a homely feel to it. The master bedroom is located to the front of the house and is modernly decorated throughout and benefits from having stylish gloss fitted sliding wardrobes which creates excellent storage. The second of the bedrooms is another double room and faces out onto the back garden. Modernly decorated like the first bedroom and again this room benefits from fitted wardrobes either side of the chimney. The third bedroom is the smallest room out of the three and is used as a dressing room. It has a mirrored fitted wardrobe and would make a perfect childs bedroom or nursery/office. The bathroom is a very modern and offers a three piece suite which includes a bath with shower over it, glass folding shower screen, wash basin and toilet. There is also a chrome towel warmer. The rear garden is a key selling point of the house as its totally private to the rear as it backs onto the park. A really well maintained garden space which has many different areas and levels, creating this fantastic outdoor space.